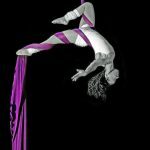 Annette is an aerial acrobatic who specialises in silks which involve a series of climbs, wraps, suspensions and dynamic drops. 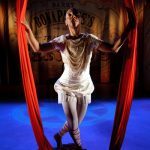 She has performed at cabarets, festival and in theatre where she choreographed a “breathtaking silk routine” for the new play “Edmund the Learned Pig” for which she played the character “Aeriella“. Annette was one of 32 Mary Poppinses in the London 2012 Olympic Opening Ceremonies who flew into the stadium arena from the 40m roof. 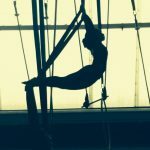 Annette originally trained in aerial silks at AirCraft Circus, which is located at the Hangar Arts Trust in south London (UK). 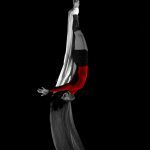 She has also previously trained in static trapeze, flying trapeze and Spanish web and is currently focusing on aerial straps.